The Daikoku-za theater (大黒座) on the street in front of Minatogawa Shrine, also known as Nanko Shrine, in Kobe, Hyogo Prefecture, ca. 1890s. There were many theaters and other places of entertainment around the shrine. Daikoku-za was founded as Kiraku-za (喜楽座) and was originally located on the shrine grounds. 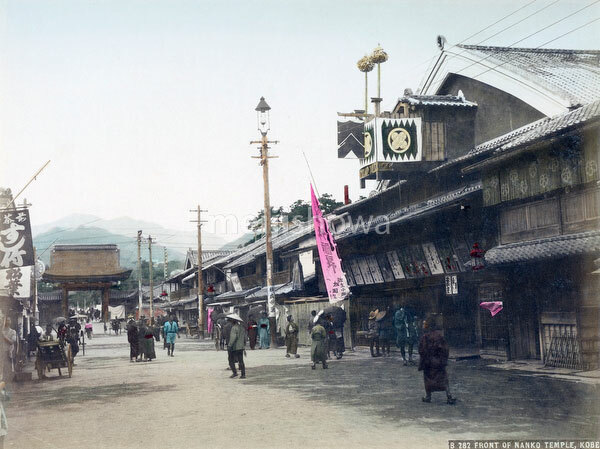 In 1880 (Meiji 13), it was relocated to this location and renamed Daikoku-za. In 1890 (Meiji 23), it underwent a large renovation which greatly increased the size of the theater. It was eventually torn down to make place for a new theater by the name of Yachiyo-za (八千代座), in use until 1960 (Showa 35).